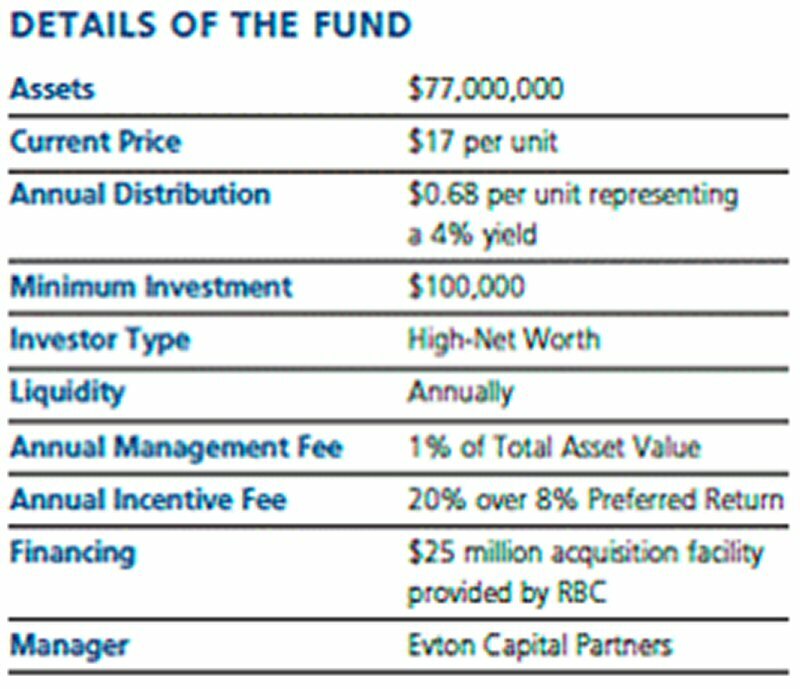 Evton Capital Partners today announced the transition of the Evton Real Estate Fund LP from a closed-end to an open-end structure, which will continue to provide investors with first-class returns through the ownership of B-Class commercial properties in Southern Ontario and the Greater Toronto Area. As a result of the Fund's transition, Evton Capital Partners has launched a campaign to raise $20 million in capital from new investors for the Fund. "The transition to an open-end structure offers investors in the Evton Real Estate Fund LP continued participation in a proven and effective investment vehicle, and presents new investors access to a top-performing real estate investment manager," said Bill Evans, co-founder Evton Capital Partners. "For high-net-worth investors, the Evton Real Estate Fund LP offers direct opportunities in commercial real estate, and provides investors with tax-efficient quarterly distributions and capital growth." The Fund is designed to offer consistent and reliable cash flow that is tax-efficient in two ways: depreciation (capital cost allowance) is deducted from income, and the cash flow distributed from the Fund is tax-deferred, as it is considered a return of capital. Added Michael Bunston, co-founder of Evton Capital Partners: "Evton Real Estate Fund LP is on the cusp of a significant growth period. The combination of a rebounding commercial real estate market from the economic downturn, and our proven track record provided an optimal time to make the transition to an open-end fund. This provides a great investment opportunity for new investors and enables Evton to raise capital and continue to make strategic acquisitions in the B-Class commercial real estate sector, generating positive growth and ROI for our limited partners." Since its inception in 2005, the Fund has been a strong performer, outpacing many other investment alternatives. The Fund's five-year annual compound return is 13.77%. Annual performance is measured by third-party appraised value. The Fund's net asset value per unit is currently $17, and distributes $.68 per unit, representing a 4% yield, per annum, paid quarterly. 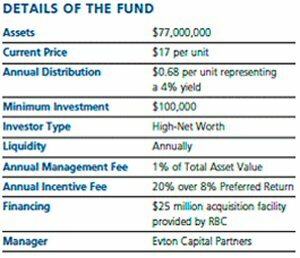 Through selective and managed growth, the Evton Real Estate Fund LP has accumulated over $77 million in assets. As the Fund is private and not publicly traded, it is not subject to the volatility that is typical of public real estate vehicles. The Fund is a limited partnership, which limits the liability of each investor to the amount of capital committed. The limited partnership structure also allows each investor to receive the income of the Fund and enjoy the attractive tax benefits of real estate ownership. As a limited partnership, the Fund is exempt from the changes that will affect the taxation of income trusts. Evton Capital Partners is a commercial real estate investment and property management firm based in Toronto. Since its inception in 1995, the company has completed 30 acquisitions representing over $130 million in invested capital in Ontario and Alberta, with a gross internal rate of return of 27% on realized and unrealized investments. Evton is focused on acquiring private Canadian real estate investment opportunities for high-net-worth investors. Past performance is not a guarantee of future returns. For more information please visit www.evton.com.